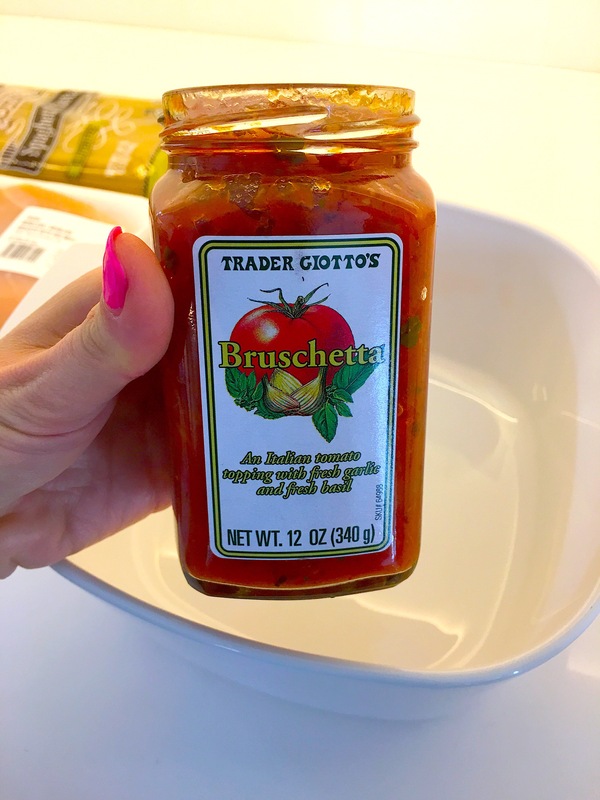 Have you guys tried Trader Joe’s Bruschetta in a jar before? It is, without a doubt, one of the best Trader Joe’s products and that’s saying a lot since I love all things Trader Joe’s. I remember the first time I tried it. I was in New York, visiting my sister in her tiny Manhattan apartment with a teensy tiny little kitchen that literally had enough space for a stove on one side and a refrigerator across. Thats it. The remaining wall was a window. There was about a foot of counter space on one side of the stove with a little cabinet above. All she had in the cabinet was some olive oil, boxes of tea, stevia and several of these jars of Trader Joe’s bruschetta. I was so intrigued by her love for this bruschetta I had to try it so we picked up some salmon and she made us the most simple dinner that literally melts in your mouth. She pulled two stools into her kitchen (I’m surprised we both fit!) and we sat in the kitchen eating the bruschetta salmon straight off the baking sheet which sat on top of the stove. During that same trip, we grabbed salads from one of her favorite local spots. I kid you not, she whipped one of these jars of bruschetta out of her purse and added it to the salad. 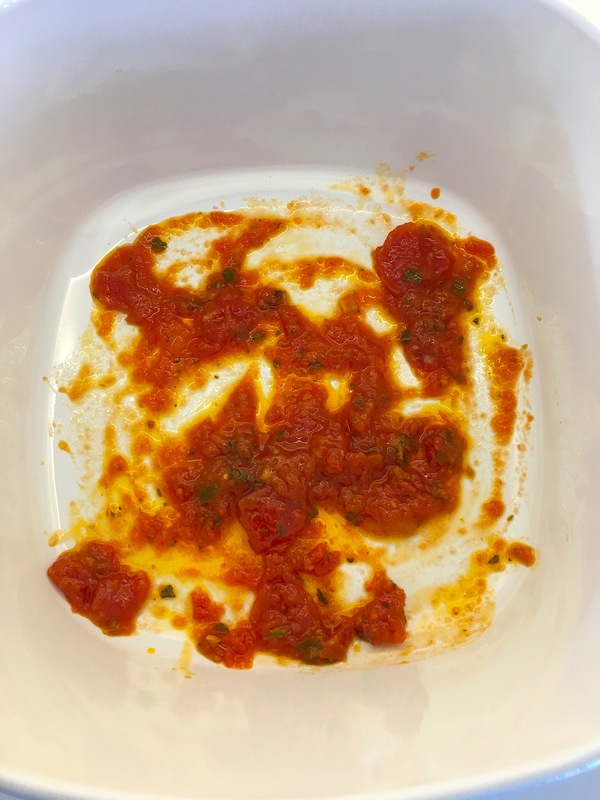 It was the silliest thing I had ever seen to carry jarred sauce in your purse, but since I had just experienced the phenomenal flavor of this sauce, instead of teasing her, I asked her to pass me the jar! If you knew my sister, I bet you’re cracking up while reading this story because that was such typical Lauren behavior. She was such a foodie and when she loved something she LOVED it!! I truly hope there’s a Trader Joe’s in heaven, because that certainly was her happy place. Anyways, yesterday I headed to Trader Joe’s, shopping list in hand and gathered up the ingredients to make the dinner I had planned. I had one last item on my shopping list, which happened to be right next to the Trader Joe’s tasting station when suddenly – Yum! The familiar aroma of the best sauce in the world filled the air. They had just pulled out of the oven bruschetta chicken and asked if I’d like to try a bite. Why yes. Yes I would! Once you’ve had this bruschetta, you’ll never turn it down. It was amazing!!! The flavors danced in my mouth and I started cracking up thinking about my sister. I ended up scrapping my planned dinner, returning all the ingredients I had grabbed for it and grabbing the ingredients needed to make the bruschetta chicken. I love how they also put out a recipe card so I could easily recreate the meal at home. This one is super easy and will definitely become a repeat dinner. 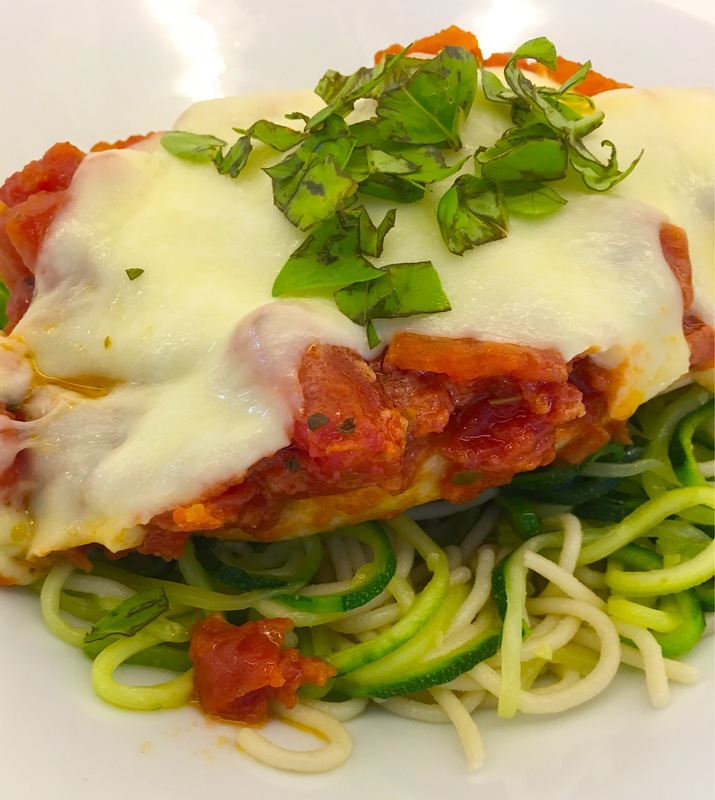 I spiralized my zoodles in advance with the Paderno inspiralizer, preheated the oven and boiled the water for the pasta before starting since this dinner cooks quick! 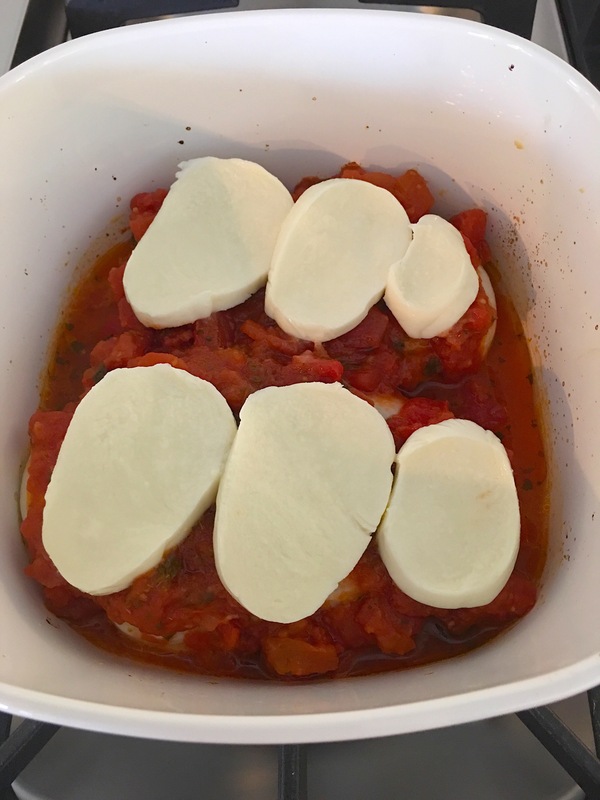 After preheating oven, pour a little bit of the bruschetta in the bottom of a baking dish. I used about two Tablespoon and used a spoon to smear over the bottom of the dish. Add the chicken and then pour the remaining sauce on top. While the chicken is baking the first 15 minutes, boil your pasta since it takes a little longer. When the 15 minutes is up, pull out, top with sliced mozzarella and pop back in the oven for 15 more minutes. During this time, sauté the zoodles in 1 Tablespoon of olive oil for about 4 minutes. 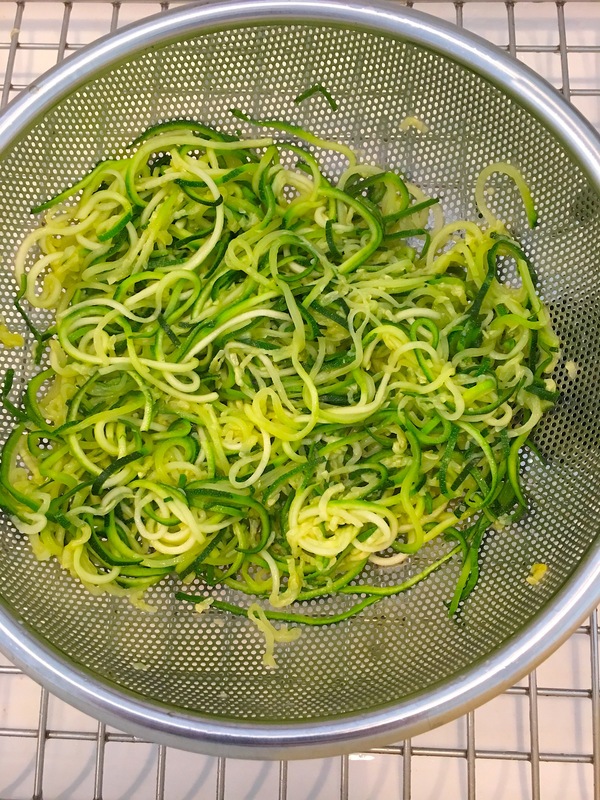 I like to strain my zoodles after they are finished cooking to get rid of any excess water the zucchini releases. 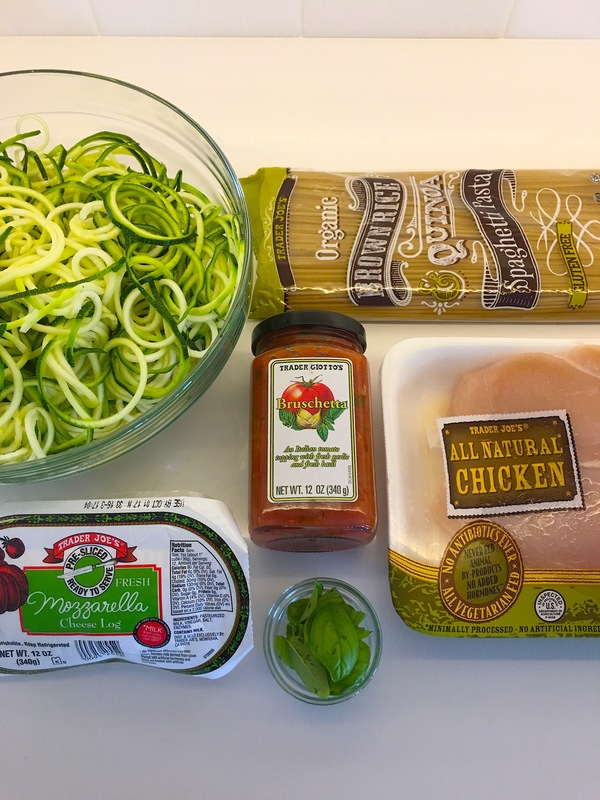 When the chicken is done, pull out and top your zoodles and spaghetti mixture. Enjoy! Pour a little of the bruschetta on the bottom of a baking dish and brush around to coat. Place chicken on top and top with remaining bruschetta. Take out and add sliced mozzarella. Put back in oven for 15 more minutes until chicken is cooked through. Garnish with fresh basil and serve over noodles/spaghetti. I loved reading that about your sister. The dish looks amazing, and I will have to make it sometime. 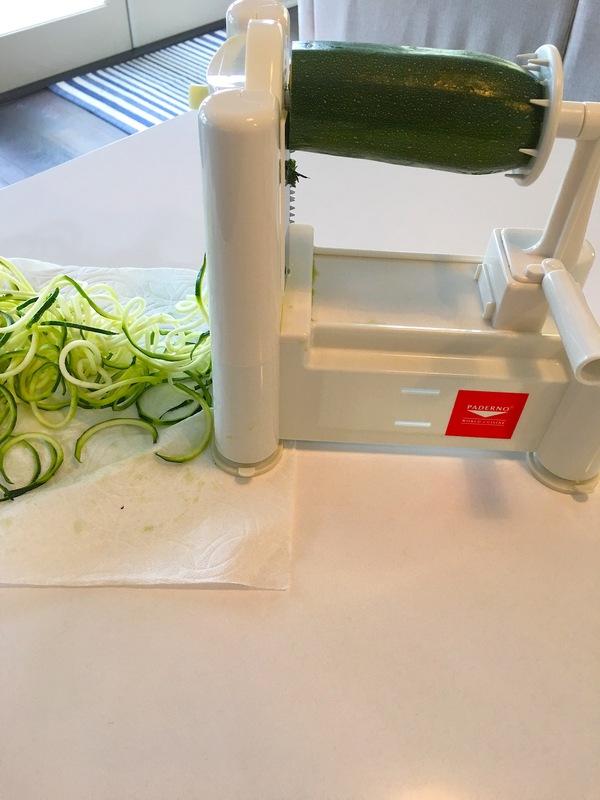 Quick question about your spiralizer: is it flimsy? I have one that looks just like it, but a different brand, and it is just such a pain to use because it is quite flimsy and not the strongest piece of equipment in my kitchen. Thank you! I’ve had the Paderno spiralizer for about two years and have never experienced it being flimsy. Prior to that, I had gone through about six and soon and never felt satisfied. After using the Paderno, I tossed all the other ones away. The only thing I would say is it doesn’t suction to the countertop the way it used to. Not that it effects its ability to work, but probably more of ware and tear on my part since I’ve used it at least 100 times in The last two years. Ive had a jar of bruschetta sitting in my cabinet. I love this idea. I might have to make it. It’s insanely delish!! Let me know what you think!! Want to receive healthy recipes for busy Moms? Sing up to receive emails when new posts have been added!